Any beauty lover will know how exciting a good brush set is – you can have all the best make-up in the world but no decent tools and it just won’t look quite as good. I am a sucker for a good brush set (or just the purchase of an individual brush that makes all the difference) so I’m excited to see that so many brands have jumped on the brush set bandwagon for gifts this year. This post is a little run down of the various options out there for all budgets…and a personal favourite of mine. Real Techniques Sams Picks Set* (Escentual, £25.40) – The Real Techniques brushes are much hyped and for very good reason. They’re fantastic – the buffing brush (the fat handle orange one in this set) is my favourite brush in my collection and has been going strong for a couple of years. There’s no other brush out there that’s managed to deliver the same buffed and perfected finish as this. 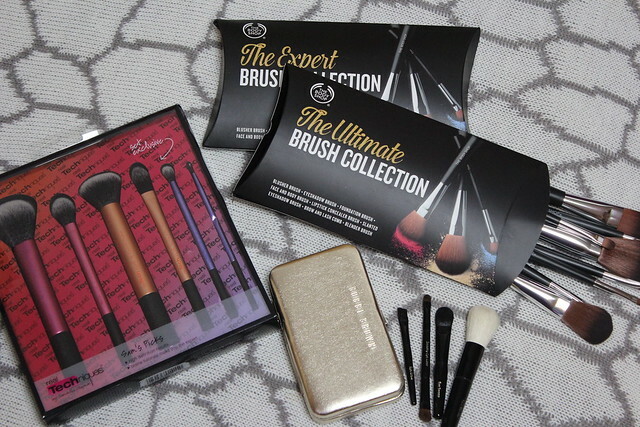 This set is my favourite of the various sets launched so far as it’s the perfect combination of all the brushes you need, from base to cheeks to eyes. At only £25 I think this is a bargain for six excellent brushes. Bobbi Brown Old Hollywood Brush Set* (John Lewis, £49.50) – If the Real Techniques brush is my all time favourite, then Bobbi Brown is a very close second – their eyebrow brush is fantastic and this little set of handbag brushes housed in a glam metallic clutch to give the ideal on the go touch up set (a mini angled brush is fab for brows, a powder brush that could work as well for a blusher as for touching up the t-zone with powder plus a couple of essential eye brushes). This is a little set that would have any beauty junkie going ‘Oooh’ as it definitely feels like a real treat! I had no idea The Body Shop even has makeup brushes! I own a couple Real Techniques brushes and I love them, but I’ll def have to check out The Body Shop Brush set.